If you are enjoying a hop around the Banana Frog DT today (or even if you are not!) - welcome! The theme for this hop is 'spring' and that immediately for me brings to mind flowers. 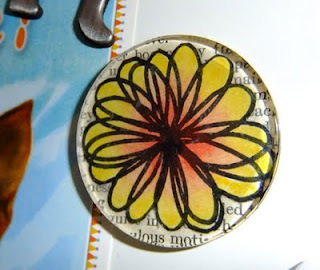 So I've used the Scribble Flowers set (again!) for my makes today. I've been playing with Tim Holtz Fragments and I've made a necklace and a fridge magnet with them. 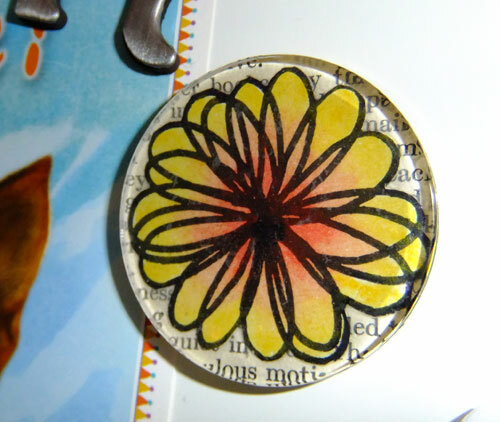 In both cases I stamped the scribble flower, coloured it with pencils and glued it onto book paper. I then stuck it to a Fragment - simple as that! I used gel medium to stick the paper to the Fragment (love that stuff, it's awesome) but you could also use Glossy Accents or Diamond Glaze. I am the last stop on your hop - or, if you've not come via the hop pop over to the Banana Frog Blog where you can see what my super talented teamies have been creating. Don't forget to leave a comment to be in with a chance to win some Banana Frog stamps! 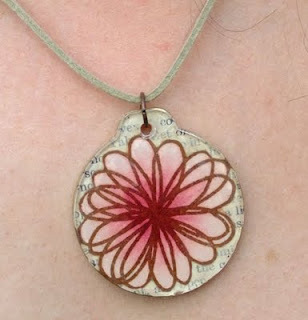 Those Scribble flowers are so versatile - great post! Love the fridge magnet idea, will have to have a go at that! Gorgeous scribble flowers and a fab idea! This is lovely, and I love the different colours. Hey Katy, what a great way to use TH Fragments and BF stamps!! Very tempted to broaden my horizons! !